Send purple roses today! Shop our collection of flower bouquets and send a purple or lavender rose arrangement available for delivery today and next day. Purple roses and lavender roses are considered to be a symbol of enchantment and love at first sight. If you are looking for a romantic gift for a loved one—whether for a date, a birthday or just because—sending a bouquet of a dozen purple roses is the perfect way to send the message. Roses in the purple and lavender color families also tend to have an air of mystery about them. Throughout the course of history, many florists and flower enthusiasts have scoured the globe trying to discover the world’s first blue rose. Blue roses do not occur naturally in nature. However, since purple and lavender roses are closer to blue than any other rose variety, they tend to share some of the wondrous reputation of the elusive blue rose. 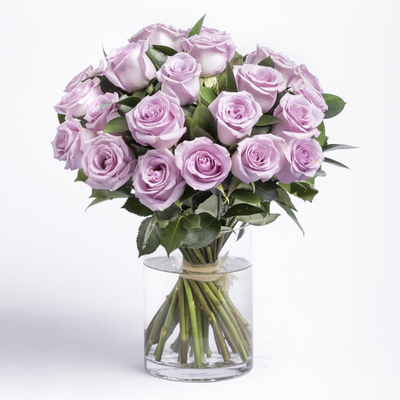 Express your enchantment for a loved one by sending a bouquet of purple or lavender roses. 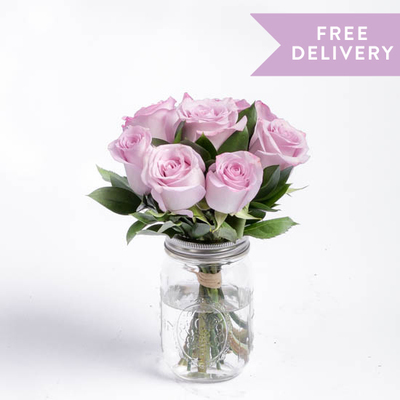 Ode à La Rose can deliver the roses of your choice to a significant other or spouse. Browse our selection above! What is the meaning of a purple rose? In most cases, purple roses are considered to convey enchantment. If red roses are meant to stand for love, romance and long-term devotion, then purple roses are supposed to send the message of love at first sight. Some florists will also tell you that purple roses stand for elegance or even opulence. When is it appropriate to send purple roses? 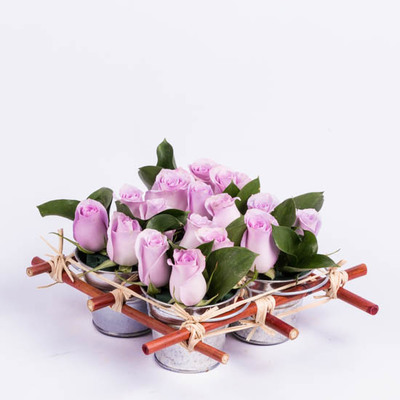 Since the meaning of purple roses is not dissimilar to the meaning behind red roses, romantics will often send purple roses in similar situations that they might have sent red roses. Given the love-at-first-sight and enchantment angles, purple roses work well as a romantic statement on a first date, but they are also good gifts for a birthday, Valentine’s Day or just because. What are the different varieties of purple roses? There are several different varieties of purple roses, each slightly different in shade, hue, blossom size and more. Perhaps the most popular is the hybrid tea rose, which delivers one large and beautiful blossom per stem. Floribunda roses feature smaller flowers in clusters. Grandiflora roses, meanwhile, are a cross between hybrid tea and floribunda roses and deliver the large blossoms of the former with the clustered, shrub-like look of the latter. We deliver fresh flower bouquets to Manhattan and Brooklyn addresses the same day they are ordered. Our team can also deliver flowers to nearly 1,500 cities in surrounding states the day after the order is placed. We deliver flowers to just about every possible location, from apartment complexes to offices, nursing homes, schools and beyond. Place your flower bouquet order with Ode à la Rose, sit back and let us work our magic! If you would like to send a flower bouquet to your spouse, friend, colleague or anyone else in Manhattan or Brooklyn, get your order in by 3 PM. Meet this deadline and our team will deliver the flowers on the same day! Our Manhattan same day flower delivery service is available on weekdays and Saturdays. Ode à la Rose can also deliver flower bouquets on Sundays if the order is entered by Noon on Saturday. Do you have a special someone outside of Manhattan who deserves a fresh bouquet of flowers? 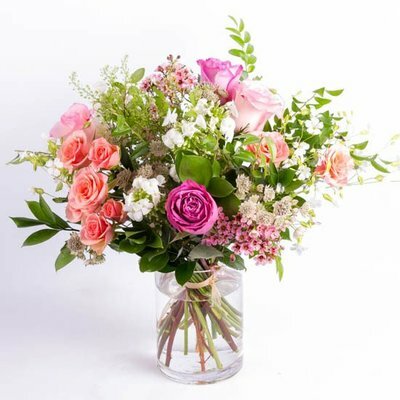 Whether this individual lives in New York, Washington DC, Rhode Island, New Jersey, New Hampshire, Virginia, Pennsylvania, Connecticut, Massachusetts, Rhode Island, Delaware or Maryland, our team can deliver flowers to him or her the day after you place your order. We build each bouquet the day before it is due for delivery, ship it overnight and drop the flowers off in pristine condition. Our next day delivery service is available on weekdays. Just be sure to place your order by 3 PM the day prior to your chosen delivery date. Monday deliveries must be scheduled by Noon on Saturday. Give us the opportunity to deliver flowers to your special someone and you will be ecstatic with the results!